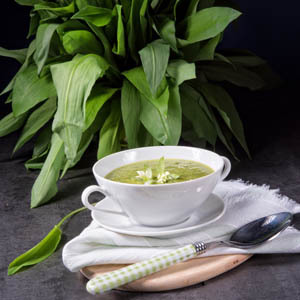 Spring soup made with fresh herbs from the meadow, garden (or market) is a special treat of early spring. It is also associated with the Easter holiday, traditionally eaten on Gruendonnerstag (Maundy Thursday). finely cut fresh herbs* such as Bärlauch (ramps), spring onions, nettles, salad burnet, tarragon, watercress, chives, sorrel or parsley. If harvesting herbs from your garden, pick them early in the morning. If using potatoes instead of cream, boil them till fork tender. Puree with a hand blender, and garnish with flowers, croutons and/or chives before serving.